Noah Webster, best-known as the man behind the dictionary, was also a key member of the group of men who founded Amherst College, and was president of the school's Board of Trustees. 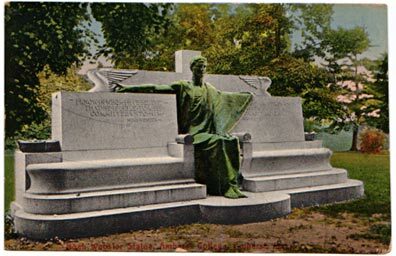 In 1914, Richard Billings of the Class of 1897 presented the statue to the school as a tribute to his father, who played a similar role in the founding of the University of California. 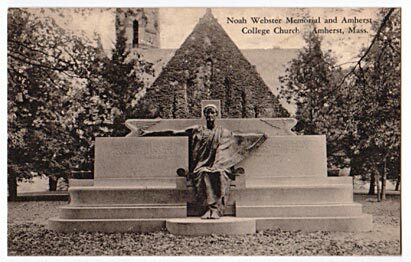 The statue was originally located as pictured here, to the west of the College Church, but when the 1938 hurricane destroyed the grove of trees that surrounded the statue, it was moved to the location second in preference by its donor, in front of the steps of Walker Hall. Though Walker Hall has since been demolished, the statue remains, behind Frost Library on the quad flanked by Morrow and Pratt dormitories (King, 137-38).